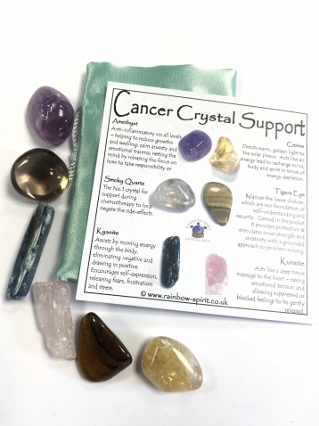 The crystals in this set have been carefully selected to complement each other and to provide balance and cleansing in specific relation to the physical, mental and emotional support they offer to cancer goddesses and warriors. The set includes six stones (Amethyst, Smoky Quartz, Kyanite, Citrine, Tiger's Eye and Kunzite) and a pouch, and comes as a set with information to explain each stone. This is one of our 'stock' items, so the photograph is an example of the set we will put together for you.